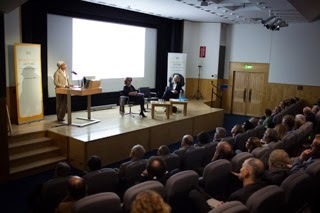 Dr Fatima Denton during her lecture at the British Library. Photo credit: Julius Honnor / IIED. Dr Fatima Denton has a mission, she wants to redraw the narrative on climate change in Africa, and move away it away from its environmental focus. Keen to understand how this might look, I interviewed her before she delivered a lecture on this issue at London’s British Library, hosted by the International Institute for Environment and Development (IIED). Dr Fatima Denton holds a PhD in Political Science and Development Studies and is the Director of the United Nations Economic Commision for Africa (UNECA), covering topics as wide ranging as climate change, the green economy, new technologies, innovation, minerals and extraction. The first thing Dr Denton was keen to explain was that we have viewed climate change in Africa as an environmental issue for too long. Africa’s economy, she explained, is growing at a 5% rate however stands a strong chance of jeopardising this impressive statistic and its entire development if it does not address the challenge of climate change. It is more than an environmental and moral issue, it is a start economic reality. There-in lies the new narrative Dr Denton would like us to adopt. Further more, a common misconception is that people in Africa are unfamiliar with the concept of climate change. Dr Denton refuted this, explaining that whilst people do not necessarily fully grasp the scientific reality of climate change, the majority of Africans understand that things are not ‘as they used to be’ and have noticed definite changes in specific environmental features, such as the length of the growing season, the timing of the rains, changes in biodiversity and the fact that temperatures are increasingly unpredictable. When I asked Dr Denton whether she was aware of any progressive leadership on climate change in Africa, she was quick to give me the example of Benin where leaders are talking about rural poverty and climate change in the same category, not in isolation from each other. She was also quick to remind me that Africa is the only region which has a committee of heads of state on climate change – The Committee of African Heads of State and Government on Climate Change (CAHOSCC) – which clearly shows is that it is an issue high on the political agenda. Governance is still greatly marred by corruption however on the African continent however. Dr Denton agreed, making the poignant point that whilst Africa does not have the monopoly on corruption, it occurs in all regions of the world, there are definite leadership issues and it is important that these are addressed by looking at how countries are governed. She hinted that rather than framing these governments as ‘corrupt’ and therefore ‘lost’, a dialogue must be opened up on how can we can evolve governance into a better place. I was particularly interested to hear Dr Denton’s view on Africa’s thirst for energy, as this is a divisive issue. Are we in a position to demand that Africa develop with clean energy, when the Western world is responsible for the majority of the worlds existing emissions? Dr Denton agreed that this was a difficult issue, and felt that part of the solution was reframing how the continent thinks about growth; if the continent does not grow with decarbonisation in mind, this will ultimately hurt development and the economy and instigate a negative feedback loop. Dr Denton maintained that African countries must create a roadmap with straightforward demands that can be taken to the Lima and Paris negotiations, examining sectors such as agriculture, technology and cleaner technologies. The continent has to be prepared to ask developed countries to for funding for energy leapfrogging initiatives which will ultimately enable them to bypass becoming locked into a fossil fuel economy and move straight on to cleantech as quickly as possible, in much the same way as it leapfrogged landline telecommunications and went straight to mobile phone technology. In her closing remarks, which pleased this Dane, Dr Denton noted that while she worked in Denmark for the United Nations Environment Programme (UNEP) before joining UNECA in 2006, she had found Denmark’s green innovation and wind farm technology hugely impressive by and hoped that this was exactly the type of technology she was hoping could be shared and developed with Africa in due course.